Philips Zoom WhiteSpeed, the No.1 patient-requested professional whitening brand, is clinically proven to whiten teeth up to eight shades in 45 minutes. With clinically superior results and efficacy versus other professional whitening alternatives, WhiteSpeed is one of the fastest ways to create brighter, healthier smiles that patients will want to show off. When combined with the pH booster in the whitening gel, WhiteSpeed’s advanced blue LED light-activated technology greatly accelerates the whitening process, delivering dramatic results you will love in just one office visit. Teeth whitening is most effective against stains that develop on the outer layer, or enamel, of your teeth – known as extrinsic stains. They can develop from the food and beverages you eat, including dark sauces, wine, coffee, soda, etc., or from unhealthy habits like smoking and chewing tobacco. During your initial consultation, we will perform a comprehensive examination to assess the nature and severity of your teeth stains/discoloration, and then recommend teeth whitening or a more appropriate cosmetic enhancement, such as porcelain veneers. Professional teeth whitening treatment involves a professional-strength bleaching agent applied to the surfaces of your teeth. The whitening gel is comprised of a peroxide-based compound that systematically breaks up stains on and underneath the layers of tooth enamel. With our teeth whitening system, the bleaching agent also oxidizes the tooth structure, called dentin, that is directly underneath enamel, brightening the main body of each tooth. Unlike other teeth whitening systems, Philips Zoom Whitespeed combines a one-hour treatment in our office with custom-made whitening trays and a gel kit that you take home. The whitening trays fit over your upper and lower teeth, and allow you to apply the bleaching agent evenly while sealing away saliva. After your in-office treatment, you can wear the trays and continue to apply touchups as needed to keep your smile permanently bright. Who needs their teeth whitened? 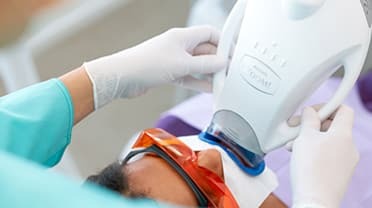 While 99% of patients surveyed experienced little to no sensitivity with Philips Zoom WhiteSpeed, tooth sensitivity is a potential risk with all whitening procedures. After your in-office treatment, your take home kit will also include a syringe of Relief® ACP Oral Care Gel to help manage sensitivity. Before recommending treatment, your dentist will thoroughly inspect your teeth for signs of weak or compromised tooth enamel, which could contribute to tooth sensitivity after teeth whitening. How Long Does it Take for Teeth Whitening to be Effective? Philips Zoom WhiteSpeed is clinically proven to whiten teeth up to eight shades in 45 minutes. With proper care and maintenance, the results of Philips Zoom Whitespeed can be permanent. By using the trays and whitening gel at home periodically, you can gain an advantage on teeth stains and discoloration in their earliest stages, before they become more noticeable. In many cases cosmetic treatments are not covered by dental insurance. You will need to speak with your dentist about the estimated cost of the whitening procedure. What if My Teeth are Intrinsically Discolored? For intrinsic stains that cannot be erased with teeth whitening, we may recommend cosmetic dental bonding or porcelain veneers. Bonding procedures use a composite resin that is applied and sculpted to the surface of a tooth, while veneers are wafer-thin shells of porcelain that closely mimic healthy, natural teeth. How Do I Know if ZOOM! Teeth Whitening is Right for Me? If a brighter smile would enhance your life, find out more by calling Modern Dentistry of Shrewsbury in Shrewsbury, MA, today at (508) 842-8838.